Last week, I shared with you an awesome low fat recipe for strawberry swirl cheesecake bars. Those were made the traditional way. I also know there are those who are not so good at baking but still want to try their hand at making a cheesecake. I have found a delicious no-bake cheesecake recipe for all of you non-bakers out there. 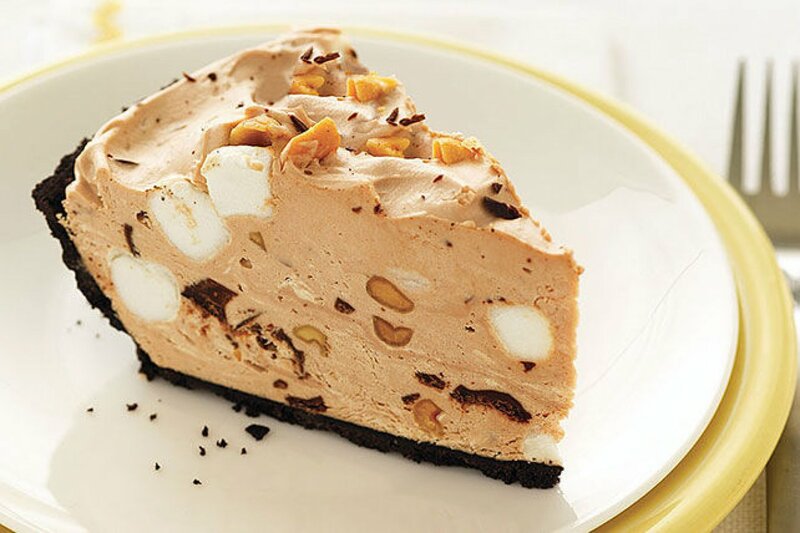 It is a match made in heaven putting together the taste of two wonderful treats, Rocky Road ice cream and cheesecake. Calm down! I am sharing this recipe from Kraft verbatim as I feel if you are going to go down that rocky road, you are going to need the extra fat for cushion. Ha ha! Mix crumbs and butter in 9-inch pie plate; press onto bottom and up side of pie plate. Microwave 1 oz. chocolate in small microwaveable bowl on MEDIUM 1 min; stir until completely melted. Beat cream cheese, sugar and milk in large bowl with mixer until well blended. Add melted chocolate; mix well. Whisk in Cool Whip, marshmallows and nuts. Coarsely chop remaining chocolate; stir into cream cheese mixture. Spoon into crust. This easy-to-make dessert is extremely indulgent, so enjoy it only on special occasions. Place completely unwrapped packages of cream cheese on microwaveable plate. Microwave on HIGH 30 to 45 sec. or until slightly softened. Which cheesecake recipe will you be trying your hand at over the holidays: Low Fat Strawberry Swirl Cheesecake Bars or No-Bake Rocky Road Cheesecake?